Labour's Tom Watson told the crowd in Parliament Square that Mrs May's deal was a "lousy" one - whether you voted Leave or Remain. He said he had this message for her: "I can only vote for a deal if you let the people vote on it too. Prime Minister, you've lost control of this process, you're plunging the country into chaos, let the people take control." One member of the crowd, German-born vet Chris Reichmann, described it as a "carnival" atmosphere - with "lots of different nationalities" but "really British in a way". 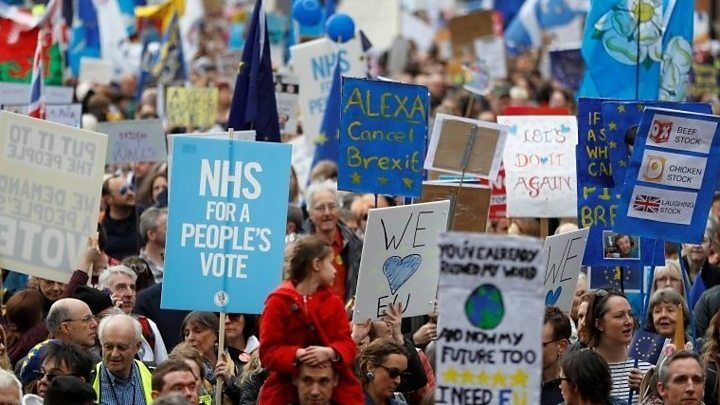 And it was noisy, with some of London's most recognisable streets overflowing with people marching steadily to a soundtrack of beating drums, whistles and blaring horns. Occasionally the hordes would erupt into spontaneous cheering, as well as chants of "What do we want? People's vote. When do we want it? Now!" Sadiq Khan joined demonstrators at the front of the march as it began, holding up a "Put it to the People" banner. He was flanked by Liberal Democrat leader Vince Cable, who tweeted that there was a "huge turnout of people here from all walks of life". But veteran Conservative MP John Redwood told the BBC: "We know that 16 million people wanted to stay in the EU, and some of those would still like to stay in the EU, and within that quite a few would like to have another go and have another referendum - but it was always a minority." Meanwhile, a record-breaking online petition on Parliament's website calling for Brexit to be cancelled by revoking Article 50 has attracted more than four million signatures. Former Ukip leader Nigel Farage re-joined the March to Leave in Linby, near Nottingham, on Saturday morning telling around 200 Brexit supporters that Mrs May had reduced the nation "to a state of humiliation". Speaking from the top of an open-top bus, Mr Farage said those gathering for the People's Vote march in London were not the majority, before leading the marchers through the village.